NEKTON-E helps to protect the cell membrane, decontaminate metabolites, hormone production and muscle functions. Furthermore, NEKTON-E primarily improves animal fertility, embryo survival rate and viability of young hatchlings. NEKTON-E also encourages the entire cell metabolism, anti-body production, increased defenses and has a positive effect on the body's immune status. NEKTON-E supplements the minimum content of vitamin E in feed and covers the animals' needs with these nutrients that are so important for the body. NEKTON-E is soluble in water and is administered daily in drinking water, or mixed in with soft feed. 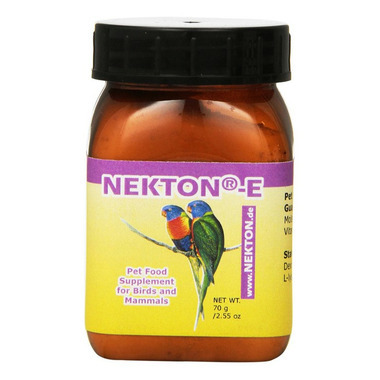 Directions: For birds: 1 g of NEKTON-E in 250 ml drinking water or 100 g soft food.